In 2018, the threat posed by climate change became all the more obvious. Disaster followed disaster, dire report followed dire report. But mainstream media coverage of climate change this year was business as usual, even as events around the globe were anything but. The summer brought us an apocalyptic stream of bizarre weather events that scientists said were worsened by climate change. Wildfires chased people into the sea in Greece, drove tens of thousands from their homes in California, and raged across Sweden as far north as the Arctic Circle. Heat waves swept coast to coast in the U.S., broke records all around the world, and killed dozens in spots as far-flung as Japan and Quebec. Hurricanes got turbocharged. While that Times piece reported on climate change as a driver of extreme weather, most U.S. mainstream media coverage of weather disasters over the summer left climate change out of the story. Media Mattersfound that TV news coverage of a heat wave in July, Hurricane Florence in September, and wildfires throughout the summer rarely mentioned climate change. 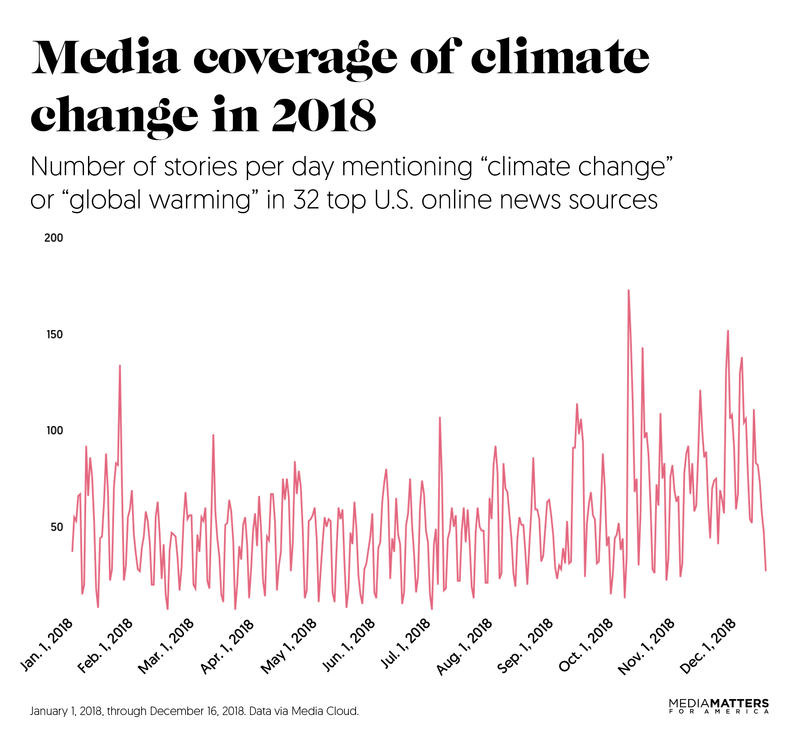 You can see that omission in the following chart showing media coverage of climate change over the course of 2018; there was no marked increase during the summer months, despite the rash of destructive weather and wildfires. The chart, using data from the Media Cloud project, shows the number of articles that included the phrases “climate change” or “global warming” in 32 top online news sources in the U.S, ranging from The New York Times to Fox News to HuffPost, from January 1 of this year to December 16. The peak of climate coverage in 2018, according to the data above, came on October 8, the day after the U.N. Intergovernmental Panel on Climate Change released a dramatic report on what the world is in for if we let the average global temperature rise more than 1.5 degrees Celsius above pre-industrial levels. But even though the release of that report triggered the year’s peak, that doesn’t mean there was enough high-profile coverage of the report. The majority of the top 50 U.S. newspapers didn’t mention the report on their homepages on the morning of October 8, Media Matters found. The IPCC report warned us that we have only about a dozen years left to get our act together and prevent the worst consequences of climate change. If major news outlets had taken their own reporting on the IPCC’s findings to heart, they would then have dramatically ramped up coverage of climate change from all angles — the dangers it poses, the people who are hurt the most, the policies that could fight it, the strategies for adapting to changes already underway, the ways that it affects energy systems, health, national security, migration patterns, and so much more. Climate reporting would have shot up like a hockey-stick graph, with headlines at the top of homepages and front pages and newscasts every day. But it didn’t. It gently settled back down toward the status quo. The second-biggest spike in coverage in 2018 came in the wake of another sobering scientific report, the National Climate Assessment, produced by more than 300 scientists from 13 federal agencies. The Trump administration tried to bury it by releasing it on Black Friday, but it got coverage anyway in the following days, including coverage of the amount of coverage. Not all of the attention was commendable; some reports incorporated nonsense from climate deniers. Still — even with all of the articles on the assessment, good and bad, plus those on other studies and reports that came out over the next week — coverage of climate change didn’t surpass the October 8 peak. The warnings about climate change piled up high, but the media coverage stayed fairly level. To get a full picture of 2018 climate coverage, you actually need to look further back. 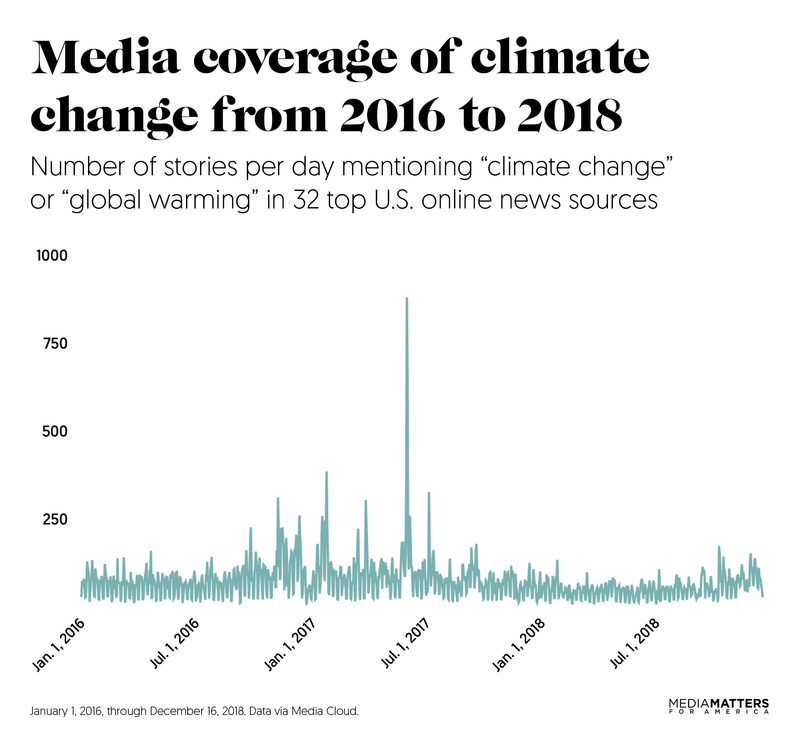 Check out this graph showing climate change coverage over the last three years, from January 1, 2016, to December 16, 2018. The media should be chasing down stories on climate science, the people being affected by climate change, and responses and solutions to the problem. Instead, even when they report on climate change, they’re still chasing Trump.